A new hope for Man arises with the first workable technology of ethics—technology to help an individual pull himself out of the downward skid of life into a higher plateau of survival. 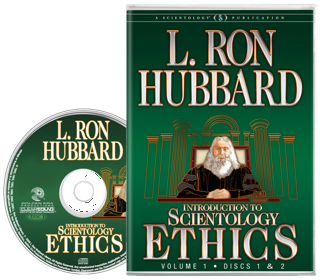 This is the comprehensive handbook providing the crucial fundamentals: Basics of Ethics & Justice; Honesty; Conditions of Existence; Conditions Formulas from Confusion to Power; the Basics of Suppression and its handling; as well as Justice Procedures and their use in Scientology Churches. Here, then, is the technology to overcome any barriers in life and in one’s personal journey up The Bridge to Total Freedom. The discoveries, breakthroughs and technology of Scientology provide a new hope for Man. With its use in one’s life, the long sought goals of spiritual release and freedom can become a reality in the here and now. Since time immemorial, people have preached the necessity to live by the tenets of honesty, compassion and decency—that integrity is the only foundation upon which true life itself is built. But no matter how well Man has intuitively known this, none could point the way to achieve it. Is it any wonder, then, that the very subject of ethics has become either what one can “get away with” or what’s good for oneself alone? One can’t live in a world where ethics itself is a charade and where justice has become a mockery of civilization. Apply this book to your life and the gates will open wide to freedom itself.